A finely crafted collection of jewelry and keepsakes. Made just for the loyal members of Red Sox Nation. The process of creating the 2018 Red Sox Championship Ring mirrored the achievements of the 2018 team by perfectly melding all elements to make history. Crafted in 14-karat white gold, this ring is arguably one of the richest in symbolism and storytelling ever made. Forming the iconic Boston B logo are 21 custom-cut genuine rubies, which represent the 4 World Series titles won by the Red Sox in the 17 seasons of FSG ownership. 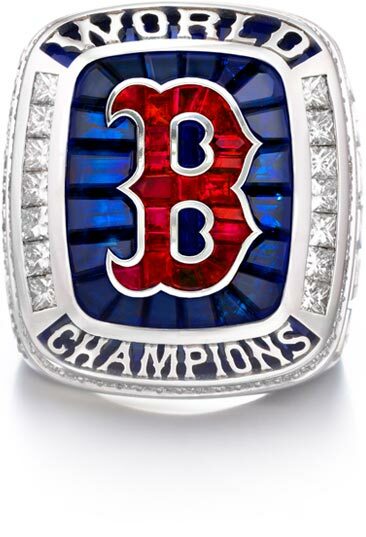 The logo is surrounded by 22 intricately set custom-cut blue sapphires, which are emblematic of the Red Sox’s 14 postseason games played and the incredible 8 home runs hit during the World Series alone. Signifying the history of the Red Sox’s postseason success are seven princess-cut diamonds accenting each side of the ring top. These 14 stunning channel-set diamonds are symbolic of the total number of American League pennants won by the Red Sox since the franchise was established in 1901. And on a foundation of two blue stones, the title WORLD CHAMPIONS is spelled out in the team’s classic font. Enhancing the brilliance of the ring is the cascade of 128 diamonds in two rows on the side. These spectacular jewels honor the 119 franchise-record wins in 2018 and the 9 World Series titles now held by the Red Sox. The left side of the ring proudly displays eight pennants featuring the years of previous Red Sox World Series titles while the ninth and largest pennant pays tribute to 2018's franchise-record wins and is accentuated by the renowned double Sox logo formed by a striking red stone. In another nod to the Red Sox's deep championship history, 100 individual weathered bricks of Fenway Park form the background of each side panel to celebrate the centennial of the famed 1918 World Series Championship. Fashioned using the Red Sox jersey font, the name of each recipient appears on the right side along with a designation of their relationship with the team. 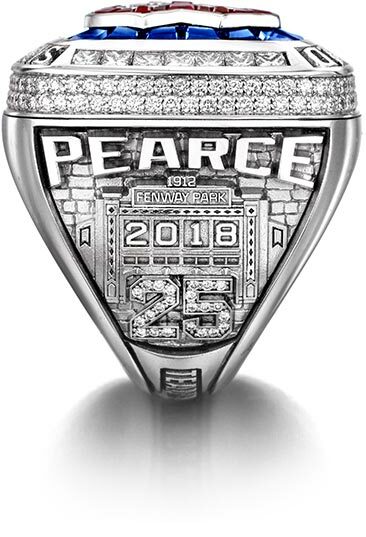 The ring belonging to Steve Pearce, the 2018 World Series MVP, showcases his jersey number 25 created with pave-set diamonds. Pearce's name and jersey number surround an intricately detailed façade of Fenway Park, the oldest ballpark in Major League Baseball and a treasured building listed on the National Register of Historic Places. Highlighted on the Fenway façade are two historically important years: 1912 and 2018. 1912, the year Fenway Park opened, marked 105 regular season wins – a record that stood for 105 seasons until it was broken in 2018 with 108 regular season wins. 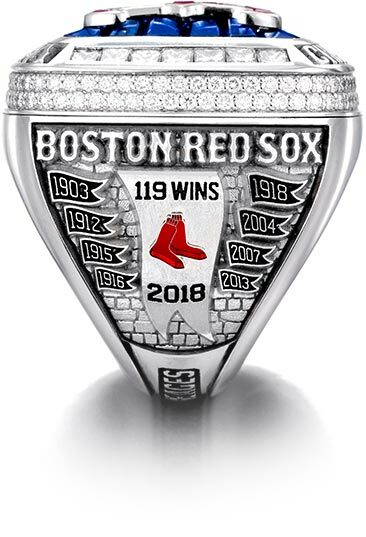 Unique to professional championship rings, Red Sox 2018 World Series rings awarded to players, coaching staff, and members of the Club are further customized to build extra special memories. Over the period of their association with the Club, those people who have been awarded multiple rings will receive rings which feature multiple images of the Commissioner's Trophy that match not only their total number of awarded rings but also the years during which they were awarded rings. 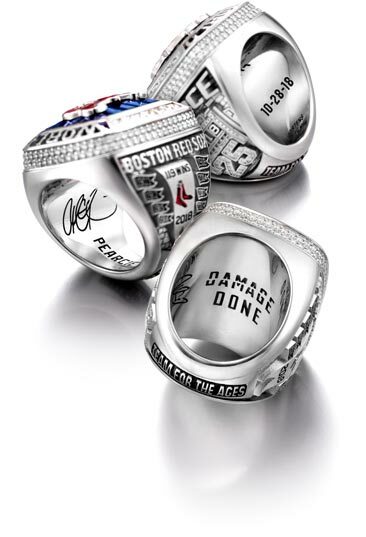 Memorialized on the interior of the ring is 10-28-18, the date of the World Series victory and the date the team's postseason adage of "Do Damage" was changed to "Damage Done". In recognition of the exceptional contributions of the players and the coaching staff, the declaration of DAMAGE DONE appears alongside each of their signatures and nicknames. The finishing touch on this championship ring replete with symbolism and imagery is an expression on the palm crest that captures the undeniable talent of the 2018 Red Sox and their place in baseball history: TEAM FOR THE AGES.